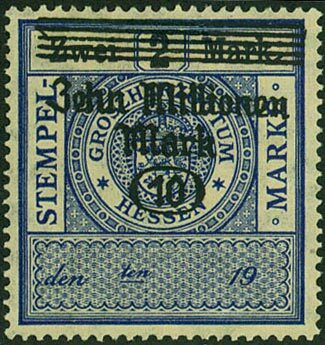 This German stamp was worth two marks when first printed, then was over-printed before being released, for an inflated value of ten million marks. It is very unlikely that in any Level 3 scenario, regular currency such as we currently have in our pockets today, will be honored or accepted by anyone, anywhere. Even in Level 2 scenarios, while US currency may retain its notional abstract value, and people would be foolish if they burned it as fuel for their fire, it is likely that people may have difficulty using it to buy things with. It will only be with a restoration of society after a Level 2 event that regular money will resume its normal role. It is helpful to understand the evolving role of money so as to understand what may happen in a Level 2 or 3 situation in the future. This article commits several gross sins of over-simplification in an attempt to explain the artificial nature of the money we all rely on today, and to point out why in a Level 2/3 situation, the acceptance of money as an intermediary abstraction of value will massively reduce. If you’re an economist, by all means roll your eyes in disgust, but hopefully you’ll agree that even though we’ve over-simplified, the key points we make are valid and essential. One of the most marvelous inventions of the present world is money. Indeed, it is such an essential element of the world that it is far from new – the oldest known examples of coins date back to the period of about 700 – 550 BC. It is possible – maybe even probable – that coinage was used prior to that time, but perhaps made of less permanent materials. Earlier forms of currency may have been fashioned out of wood – wooden nickels – or bone or other materials that probably have not survived down the millennia to the present day, and/or if they have occasionally survived, have not now been recognized as forms of money, being thought of instead as pieces of art and jewelry and tools. Okay, so we all like money – or, more to the point, we all like the concept of wealth in general. But why is money, as a means of trading, so good? There are many reasons for this, some becoming quite technical and less immediately relevant, but let’s look at a few obvious and relevant ones now. In quick summary, money is good because it provides a convenient method of converting or exchanging between different things, and a non-perishable way of storing wealth. Money makes it easier to trade the items you wish to sell for the items you wish to buy. You can choose the person to buy your goods based on how much money they will pay you, not based on what products they have to sell in exchange, and you can choose the people you buy things from based on the prices of the products they sell rather than on their willingness to buy the products you have to sell. If you have spare assets – for example, food items – you can sell them and the money you received will not perish or go stale. Money also is easier to store – it takes up less space, and doesn’t require any special care. The size of money also means that if you need to buy something from the market, you don’t need to fill your vehicle with whatever it is you hope to exchange for the products you need – and if your attempts at exchanging the items are unsuccessful, you don’t need to take it all home again. You simply keep the money in your pocket. Money also makes pricing more predictable. As in the earlier example, the value of things now becomes a more universal sort of concept, rather than based on the vagaries of who would wish to buy them at any given time. Money – An Abstraction or a Tangible Representation of Wealth? These days, most people conduct most financial transactions without money ever physically passing from them to the person they are buying or selling something with. Credit cards, internet transactions, electronic banking, even relatively old-fashioned checks – all of these are abstractions of the underlying money, but they work based on the accepted high probability that these abstractions can be readily converted into real money – although depending on a store’s check acceptance policies, these assumptions are not always universally accepted. It is easy to understand how a credit card transaction or a check embodies a statement along the lines of ‘by this piece of paper (check) I am instructing my bank to transfer some of the money it is holding on my behalf to your bank, from which you can then spend or withdraw it as you wish’. Now for the really important issue, which most people live their entire lives without ever considering, and – happily – without ever needing to consider. What is the underlying actual value of the money in your pocket? How was this value set? How might it change? Even the question itself is difficult to phrase and express, because it is such a foreign concept for many people. What is a dollar worth? A dollar is worth a dollar, right? What is the question? This is actually a very important question after the end of LAWKI. At present, we all have – to a greater or lesser degree – reasonable confidence in our government and our economy. We all believe that a dollar is worth a dollar, and don’t need to second guess the issue at all. Indeed, there are historical reasons for this confidence. It used to be that a dollar was exchangeable for a dollar’s worth of gold bullion. Our currency was asset backed. No-one needed to question its value, because we all knew that a dollar was worth a dollar’s worth of some certain asset – typically but not exclusively gold for higher values, and silver for lower values. This has been the historical underpinning of currency. While money is also an abstract representation of some sort of underlying tangible object, the fact that it can be exchanged for the underlying object of value has confirmed the abstract value of the money itself. Money has been, for most of its history, either inherently valuable (ie made out of valuable metal that is worth about the same as the face value of the money) or convertible to an object of known value. This underlying concept of either inherent value or convertibility to known value also helped trading beyond a small region. Although these days exchange rates between currencies around the world are based as much on abstractions as on realities, back then, exchange rates were simple – ‘My one ounce gold coin, which I call a dollar, converts to two of your half ounce gold coins, which you call pounds’ (or whatever other currencies were being traded). A time came when it became more convenient to carry around representations of the underlying gold or silver or whatever, rather than to actually carry the precious metal itself. Just as gold coins saved us the hassle of carrying our assets with us, paper banknotes saved us having to carry around a stack of gold coins. Institutions – banks – were created, and they would hold all your money for you (in the form of gold or other precious tangible things) and then issue ‘IOU’ forms indicating that the forms could be taken back to the bank and swapped back to the gold. These IOU forms became banknotes. So far, so good. But then we started to (perhaps) get too clever for our own good. Banks noticed that people rarely came back to ask for their gold, and so they started to issue more IOUs than they had gold in their vaults. This worked fine until or if there became a rush on the bank, and all of a sudden, the bank couldn’t redeem all its IOUs and that was considered to be a generally bad thing by the people holding the IOUs, which had now become worthless. So the government centralized the role of controlling the issuance of IOUs, making it harder for banks to cheat the system for personal gain (but, alas, not making it impossible – not then, and not all the way through to the present day). It is important to understand that initially the governments took the role of becoming the master issuer of banknotes so as to protect the underlying value of the currency. But, before too long, they started to succumb to the same temptation that private banks had, too. Why should they limit themselves to only issuing enough banknotes to represent the gold they had in their vaults? Fortunately, and most of the time, we do not need to question what it is that supports the value of the money we have. If I say ‘this is worth a dollar’ and you say ‘so too is this worth a dollar’ we are using the dollar as an intermediary way of equating the value of my item and your item, based on our broad knowledge of the values of other items and the value of how we could otherwise spend a dollar’s measure of money. The key reality is that we have each used a common scale to equate the value of the items we have and might be considering exchanging, and a commonly accepted form of holding on to and passing over the intermediary value of the objects we are trading (ie the coins and banknotes). We could measure everything we buy and sell in pounds of wheat or gallons of gas or anything else, too; but in the present world, it is easiest to use dollars as a universal measuring tool, and as a universal way of conveying value from one transaction to the next. But this measuring tool is not a sacrosanct object that stays fixed in form. The government can change things by putting more money into circulation (or by taking money out of circulation). This can be a hard concept to understand, and in very simple terms, think about this : If the total value of things in a town comes to 5000 units of value, and if all the money in the town comes to $10,000, then do you kinda sorta see how you can say the 5000 units of value equate to $10,000? Each unit is worth $2. Now if suddenly we get more units of value – say the main value of things in this town is food and there has just been the annual harvest – what happens? We still have $10,000, but now we have 10,000 units of value. You know that when something becomes more readily available, the price drops, and this is what happens in our terribly simple economic model. Each unit is now worth $1. Of course, if something happens and half the stored food is destroyed, you’ll have 2,500 units, making each value worth $4. So far, so good. But what happens now if the town prints off another $10,000 in banknotes. We now have $20,000 in money, and still the same original 5,000 units of value to spend the money on. Do you see how adding this extra money, without adding extra value at the same time, means that each unit of value is now worth less. Instead of a unit costing $2, it now costs $4. This is an example of inflation. If the supply of money increases at a greater rate than the underlying wealth of the economy, the value of things gets reduced and their costs increase, because there is a tendency for the total value of all real items of value to equate the total sum of the money in the economy. Now if you are a federal government and you need to pay for a $1 billion expenditure – maybe a foreign war, or a new capital works program, or whatever, you have an easy way and a hard way to get the money you want. The hard way is to tax your citizens, or to divert money from other forms of expenditure. The easy way is to simply print another $1 billion in currency and use that new money to pay for the project, without needing to tax your citizens. They love it – they have a new freeway or whatever, and haven’t had to pay any taxes. Except that the value of the currency has been reduced, and the prices of everything goes up. This would be impossible if each dollar had to be represented by a dollar’s worth of tangible value, but these days, that requirement has long since been abandoned, and so inflation occurs. We’ve grown tolerant and accepting of a small amount of inflation (and there are other reasons for inflation too, some of them almost ‘good’ reasons). But what happens if our government breaks its ‘social contract’ with us and irresponsibly prints way more money than it should? Maybe you’ve seen the pictures of inflation-ridden Germany in 1923, and of their banknotes with incredibly high values on them. Similar things have happened more recently in Zimbabwe, and slightly less spectacularly in Russia. Remember how we said that if you print more money, the price of things goes up? Well, in Germany in 1923, the government was printing so much money that it had 300 paper mills and 150 printing companies with, between them, 2000 printing presses, all working around the clock, printing money as fast as they possibly could to fuel the fires of its runaway inflation. By October 1923, only 1% of the government’s revenue was coming from traditional sources such as taxation. The other 99% was being artificially created by printing more worthless money. An item that cost 1 mark in January 1923 was costing 261 million marks by November. The value of currency was dropping so rapidly that workers were being paid three times a day. But the ‘real’ cost of things remained the same. Although the cost of a loaf of bread in Germany rose to 200 billion marks at one point, two things remained more or less constant. The relative cost of a loaf of bread and a pint of milk and a new pair of shoes remained closely similar – everything was going up in value simultaneously. And the number of hours of work it took to earn enough money to buy one of these items – that stayed much the same as well. The other thing that remained much the same was the cost in foreign currency to buy the item. The cost of bread was skyrocketing in terms of the cost in German marks, but the number of marks you could buy per dollar was also skyrocketing too. So it has been common in some countries experiencing hyper-inflation for a second stable currency to co-exist alongside the local currency. Historically that has usually been the US dollar – indeed, during Russia’s early independence after 1991, many items in shops were priced in US dollars rather than in rubles, and the price was converted to rubles only at the time the item was being purchased. What this shows us is that if people lose confidence in their currency, or if their government plays financial games with it, the currency will fail, but the underlying economy can survive, albeit using a different form of currency. But because the role of money – marks in the case of 1923 Germany – as an intermediary was totally destroyed, and back then there were not the modern convenient ways to price items in an external currency – so too was the German economy. Other economies have only managed to survive by basically ignoring their local currency and using some external reference point for trading purposes. At present, the US has an efficient national economy, with many trillions of dollars of transactions occurring every year. Goods, people, and money can freely move all around the nation, and while there are some regional variations, in general, a dollar is worth a dollar, wherever you go, and can be freely converted into a dollar’s worth of goods. After a Level 2/3 event, the country will fracture into tiny regions, each having their own micro-economy. Maybe your micro-region has a surplus of food and a shortage of energy. Food will be cheap and energy will be expensive, because the ability (and or costs) of ‘exporting’ food to another micro-region and ‘importing’ energy will be massive. The opposite might apply just 100 miles away. That’s okay, and doesn’t destroy the value of money by itself. But wait – there’s more. A dollar is only worth a dollar when we know we can for sure use it to buy the things we want and need. Remembering back to the earlier example, if there is a shortage of goods, they will become more expensive. In our micro-economies, we will move from an economy where the limitation on transactions is more to do with people’s personal wealth and their ability to afford the items they want to buy – this is the situation at present for most of us; and instead it will become an economy where the limit is not on the money we have, but the shortages/availability of things to buy, no matter what their cost. Today, imagine two people. One person has 10,000 gallons of petrol stored in a tank, but no money in his bank account. The other person has $10 million in his bank, and only half a tank of gas in his car. Which person would you rather be? Most of us would prefer to have the $10 million – maybe we’d spend $100,000 of it to buy/build some storage tanks and fill them with 10,000+ gallons of gas, but we’d still be left with $9.9 million to enjoy in other ways, and to buy anything we wanted. But, after the end of LAWKI, who would you rather be? The guy with 10,000 gallons of petrol in storage? Or the person with an entry on his bank statement saying ‘Balance = $10,000,000’? What would you now be able to buy with your millions? This example shows two things. First, clearly 10,000 gallons of gas, formerly worth maybe $40,000, are now worth way more than $10 million! Secondly, just having money no longer matters. The former easy convertibility between money and things of real value has been destroyed. If you can only accept one of these three people, who would you choose? We’ll let you argue as between the man with food and the doctor, but chances are, the millionaire will be left outside, unwanted and unwelcome. 1. The completely different economic basis of life after a Level 2 or 3 event will completely change the current relative values of things. Luxury goods will become worthless. Common ordinary items will become invaluable. 2. Because our current US currency has no underlying real value, it will cease to play a role in a Level 3 scenario, and will be put ‘on hold’ during a Level 2 scenario, or perhaps massively devalued. A pound of meat might cost two pounds of wheat, or $500. 3. The most important things for a person to have will be skills and tangible items that extend life. Even gold and silver will be less valuable than a knowledge of farming, animal husbandry, medicine, etc. A pound of food will buy another day or more of life; you can’t eat gold or silver. 4. Due to the compelling benefits of currency as an intermediary in all forms of exchange, initial bartering systems will be replaced by new regional currencies, with real asset backing. 5. The most dangerously useless part of your own preparing is to accumulate abstract intangible wealth – ie, stocks, shares, bonds, CDs, etc. None of these things won’t be of any value to you WTSHTF. Accumulate assets that will assist you with food, shelter, comfort and security, not money, because in a Level 2/3 scenario, money won’t buy you any of these life-essentials. Spend your abstract wealth now and convert it to life enhancing supplies. Indeed, borrow money to get these things now – if TSHTF, you’ll have the supplies you need, and the debt you incurred will probably become meaningless.